Situation in Tajikistan took a definite turn for the worse last week-end. Colonel Oleg Zakharchenko, commander of the Interior Ministry's OMON (special assignment police squad) was killed in a clash between representatives of two different security structures in Garm located 220 kilometers east of Dushanbe. The opposition claims that OMON was dispatched to Garm to deal with former activists of the United Tajik Opposition energetically hunted down all over the republic these days. Official Dushanbe denies the innuendo. What information is available indicates that the Tajik authorities prepare a major military operation to find the officer's killers and avenge his death. Garm population braces itself for defense of the township. Threat of a new civil war is once again the talk of the day. Preparations for a reporting back conference of law enforcement agencies lasted in Garm all last week. The authorities maintain hat Zakharchenko with some subordinates set out for conference in Garm on Saturday. When Zakharchenko with his men approached the Garm District Department of Internal Affairs, however, they were set upon by men wielding automatic weapons. The skirmish lasted 30-40 minutes. "Zakharchenko was killed right then and there. His four subordinates were wounded and hospitalized," RIA-Novosti quoted a source in the Tajik Interior Ministry as saying. The opposition meanwhile claims that participation in the conference was not what Zakharchenko intended. "They [OMON servicemen - Kommersant] rode up in two KamAZ trucks, formed a ring around the building of the district department of internal affairs, and told the people inside to lay down their weapons," Dodojon Atovulloyev of the movement Vatandor said. According to the opposition leader, the visitors were particularly interested in Colonel Mirzohodja Ahmadov, Organized Crime Department Commander. Ahmadov himself confirmed it in an interview with the BBC Persian Service on Saturday. A field commander of the United Tajik Opposition in the civil war in Tajikistan (1992 - 1997), he commands vast respect from his former subordinates and the locals. Ahmadov said he knew for a fact that the republican OMON was coming to eliminate him for his past with the United Tajik Opposition. Representatives of the opposition maintain that an undeclared war on former activists of the United Tajik Opposition is under way in the republic, mounted on President Emomali Rakhmon's orders. "A great deal of them were imprisoned. Others are waiting for their turn," Atovulloyev told this correspondent. The authorities began with ex-leaders of the opposition (people like former head of the Customs Committee Mirzohidji Nizomov, Tajikgaz ex-director and Democratic Party leader Mahmadruzi Iskandarov) and worked their way down to whoever had never occupied any key positions in the United Tajik Opposition. 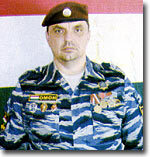 Mukim Muhabbatov, commander of a border guards detachment and the brother of a prominent opposition activist Salam Muhabbatov, was killed last summer under suspicious circumstances. Major Tohir Chorshanbiyev, commander of another border guards detachment and another ex-commander of the United Tajik Opposition, was arrested in Gorny Badakhshan last year. The order to collar Chorshanbiyev came from Dushanbe and it was to Dushanbe that he was promptly escorted. When Chorshanbiyev was taken to Dushanbe, however, his followers in Gorny Badakhshan took a hostage (the head of the local state security department), and the authorities were compelled to let Chorshanbiyev go. Last but not the least, arrest of another former activist of the United Tajik Opposition was attempted in Garm not long ago. This man, however, escaped. Spokesman for the Tajik Interior Ministry claims that this structure and the State Committee for National Security set up an investigation panel and dispatched it to Garm. What information is available to this newspaper indicates that the authorities prepare a major military operation to avenge Zakharchenko's death. Several rallies took place in the Garm district yesterday, their participants demanding from the authorities to put an end to provocations that might trigger a new civil war.